Do you remember wishing for Pony Rides for your Birthday? Whether you ever had a Pony come to your Birthday Party or not, you now have the opportunity to rent one for your child or grandchild! Kids love Ponies and Arizona is a great place to enjoy them. We can bring one or two to your home or park. Voted "Best Upscale Birthday Parties" by Phoenix New Times, you can be sure we will add fun and quality to your child's special day. Thank you for making Sophie's 5th Rodeo extra special. The sheer excitement of the kids was overwhelming. Thank you for having Stormy and Beau join us. My husband was especially impressed by how well behaved and trained the animals are. Who knew? "no mess" pony rides. Loved it! The hay bales were a nice touch to our theme. Thank you again, this is one party both the parents and kids are still talking about today! I would like to say that the entire process was awesome!!!! I would definitely recommend you guys and would use you again. Great job, my daughter's party was a success thanks to Stormy the pony. He was so sweet and gentle, the handler was very pleasant with the kids and knowledgeable about ponies. So glad you let us feed him because the kids and parents were super excited. We will definitely use A Child's Joy for all my parties. Call us now at 480-820-8030 or reserve your Pony online. 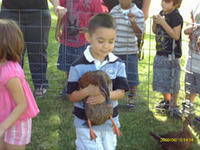 Because of this we can offer discounts when you add a Petting Zoo, Clown or Bounce House to your Pony Rides. Remember; part of the rental fees for any item from any business go to cover the time of travel. So it only makes sense that having your entertainment travel together saves you money!